Rhino Track Drive Module - AndyMark Inc. 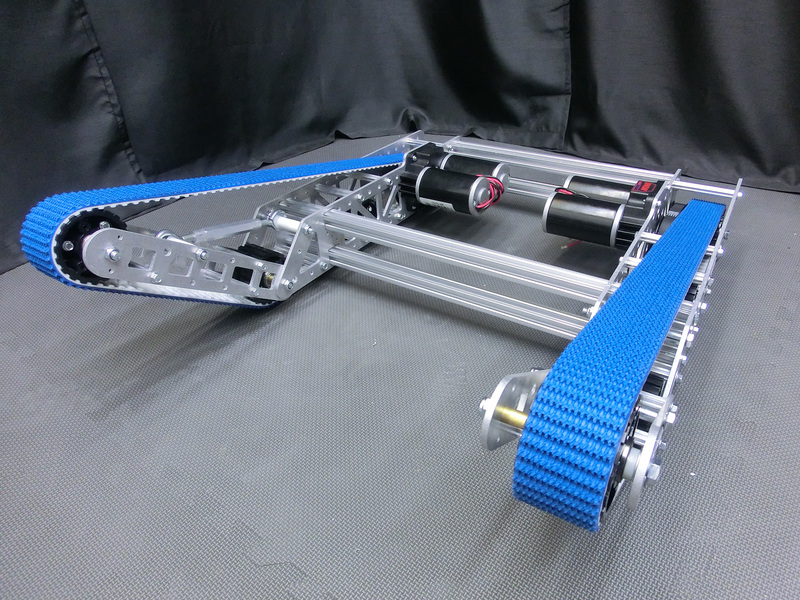 The Rhino Track Drive is a tank track module utilizing a two (2) inch wide timing belt tread. Four (4) robust molded pulleys direct the path of a high grip belt, driven by an optional AndyMark gearbox or transmission. Two (2) of these modules can be used to create a tank drive-base like our Outdoor Rhino Track Drive (am-3446). 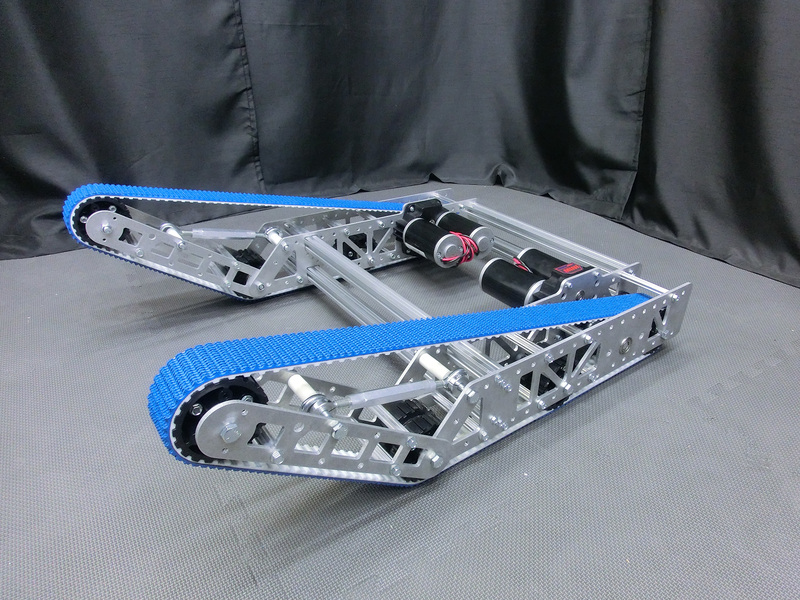 The Rhino Track Drive features rigid, 3/16 inch thick aluminum plates and an easily adjustable belt tension mechanism. This is an ambidextrous module, so it can be used for the left or right side just by switching the plates from one side to the other. Once mounting it to cross braces like REV Extrusion, not included, or another Chassis, you can choose to make countersink holes on the appropriate sides. The Rhino Track Drive Module ships in an un-assembled kit. Please see the assembly instructions on the "Files and Documents" tab for any assembly assistance. NOT INCLUDED: A gearbox, such as the Toughbox Mini, as shown in the layout print and example pictures. Bumper brackets (am-3358) are available, but not included. This module includes one belt. In order to create a typical drive system for most applications, two modules will need to be purchased. 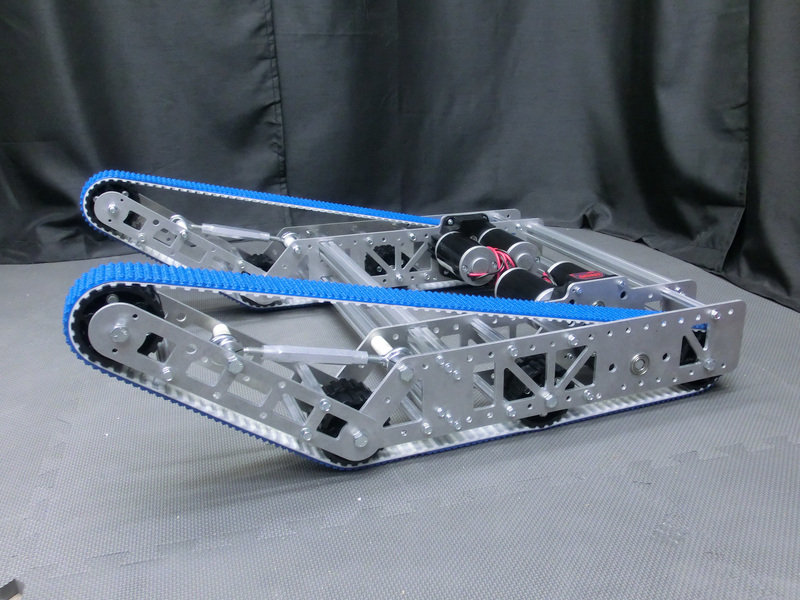 We suggest the use of four (4) pieces of 1" wide REV extrusion as bracing structure between two Rhino Track Drive Modules. Pictures of this setup version are shown on the "How To / Pictures" tab. Use a rubber to rubber adhesive such as super glue. This has great bonding properties to adhere the tread (roughtop carbox, in this case) to the urethane timing belt material. Keep pressure on the newly glued area by moving this area over an end pulley. This applies continual contact between the rubber and timing belt. Wait 20-30 minutes for the adhesive to cure. Belt Tension: Proper belt tension is detailed in this document. Please see this page for more details about the progression from the original pulley to the now current Rev4 pulley. All orders of Rhino Track Drive Modules will ship with Rev4 pulleys. The directions leave something to be desired especially when a high school robotics team with little mechanical knowledge is trying to learn how to put things together.